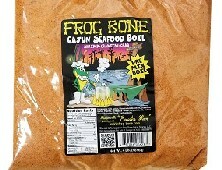 Home > New Orleans Food > Frog Bone Spanish Moss (White BBQ) Sauce, 12 oz. Spanish Moss (WHITE BBQ SAUCE) is everything from Frog Bone's Bayou BBQ sauce but with a mayo base. Has a little spice to it. Perfect for grilling on chicken, pork chops and unbelievable as a salad dressing. 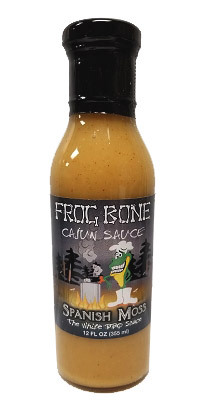 Frog Bone Spanish Moss (White BBQ) Sauce The Frog Bone Spanish Moss (White BBQ) Sauce has all the tasty ingredients of the Bayou BBQ sauce but with a mayonnaise base. The Spanish Moss sauce tastes very similar to a honey mustard but with no honey in it at all. What would I use a White BBQ sauce for? The Frog Bone Spanish Moss sauce is great for making potato salad, coleslaw, ham & cheese or turkey sandwiches, and dipping for chicken tenders and french fries. The White BBQ is also great for grilling on chicken and pork chops and even as an unbelievable salad dressing.